Afghan President Hamid Karzai said Thursday that he could allow the United States to keep nine military bases in the country as part of negotiations over a long-term security pact with Washington. After more than 11 years of US-led military intervention in Afghanistan, the two countries are hammering out a deal to allow a limited US troop presence to remain when the international coalition leaves next year. The size of the "residual" force has not been agreed, with numbers ranging from 2,500 to 12,000, according to US officials, as Washington winds down a war that has become deeply unpopular at home. Soldiers kept in Afghanistan would target Al-Qaeda militants and help train the local army and police. A hasty withdrawal of forces could threaten fragile gains secured since the Taliban were ousted in 2001. "We are in very serious and delicate negotiations with America," Karzai said. "America has got its demands, Afghanistan too has its own demands, and its own interests.... They want nine bases across Afghanistan." Karzai said he would allow bases in Kabul, Bagram, Mazar-i-Sharif, Jalalabad, Gardez, Kandahar, Helmand, Shindand and Herat if Afghanistan's security and economic conditions were met. "We agree to give you the bases. 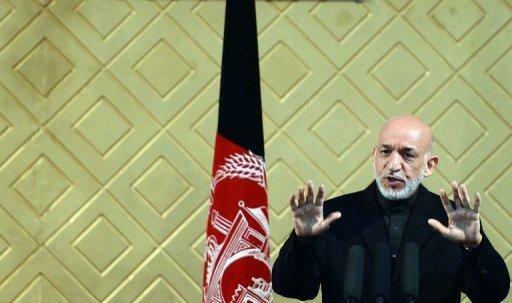 We see their staying in Afghanistan beyond 2014 in the interests of Afghanistan as well as NATO," Karzai said. "Our conditions are that the US intensify efforts in the peace process, strengthen Afghanistan's security forces, provide concrete support to the economy -- power, roads and dams -- and provide assistance in governance. "If these are met, we are ready to sign the security pact," Karzai told his audience during a speech at Kabul University. The White House said US troops would stay in Afghanistan after 2014 "only at the invitation" of the Afghan government and Washington is not seeking permanent bases there. "As the president has already made clear, the United States does not seek permanent military bases in Afghanistan," White House press secretary Jay Carney said. "And any US presence after 2014 would only be at the invitation of the Afghan government and aimed at training Afghan forces and targeting the remnants of Al-Qaeda." US officials have reportedly said that if 6,000 troops were kept in Afghanistan after 2014, only two bases, in the capital Kabul and at Bagram airfield, would be maintained. Relations between the US and Afghanistan have been rocky this year as a transition phase begins with 100,000 NATO coalition troops pulling back from the fight against the Taliban. Afghan security forces are taking over responsibility, but doubts remain whether they will be able to control insurgent violence that increasingly focuses on local soldiers and government officials. Karzai caused outrage in Washington in March when he accused the US of colluding with the Taliban to justify its presence in Afghanistan, and he has also regularly criticised US forces over their treatment of civilians. The US has avoided revealing its plans in Afghanistan after 2014 and Karzai's claim that a total of nine US bases may be kept open will intensify pressure on President Barack Obama. Immunity from Afghan law for the remaining US troops is likely to be a key demand from Obama, and Karzai has said the issue may have to be decided by a gathering of tribal elders. 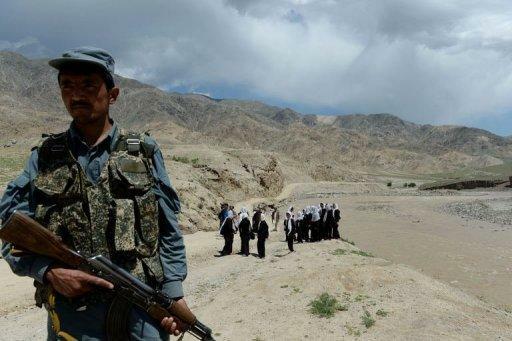 Waheed Wafa, analyst and director of the Afghanistan Centre at Kabul University, said the president -- who is due to step down next year -- was testing public and regional opinion on the future US troop presence. "Previously he said the US wants bases, now he gives this figure (of nine bases) and later he may give more details to see the reaction," Wafa said. "He is also keen to judge the response of Pakistan and Iran." 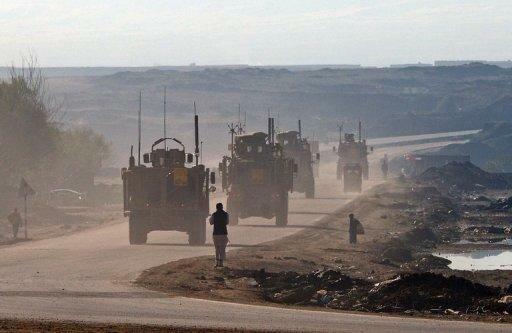 US military vehicles drive along a highway linking Kabul to Bagram, on March 25, 2012.Afghan President Hamid Karzai said Thursday that he could allow the United States to keep nine military bases in the country as part of negotiations over a long-term security pact with Washington. Afghan President Hamid Karzai talks during a ceremony to mark the 80th anniversary of Kabul University on May 9, 2013. Karzai has vowed to wring concessions from the United States in negotiations to sign a security pact, saying Washington wanted to retain nine military bases in the country. An Afghan policeman stands guard as schoolgirls wait for a bus in Qara Zaghan village in Baghlan province on May 7, 2013. US troops will stay in Afghanistan after 2014 "only at the invitation" of the Afghan government, and Washington is not seeking permanent bases there, a White House spokesman said Thursday.